Find Better Ideas, Faster ® with a custom heels trend report, our PRO Dashboard and 80+ categories of premium trend reports. The Heels Trend Report features dynamic innovations surrounding shoes for women and high heels. Our report will provide the latest trends in peep toes, stilettos, wedges and pumps. Users will have access to reemerging patterns shaping consumer tastes such as the return of platform shoes, heels for men and more. The data collected in our report is beneficial to all in the fashion industry, whether you sell shoes online or work for a boutique seeking to spark creativity for the latest collection. Our Heels Trend Report features innovations from Jeffery Campell Shoes, Christian Louboutin and other top designers. 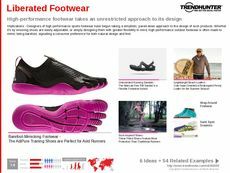 Use the Heels Trend Report to give your business a running start for 2012. Our research will provide companies with an insightful look into the footwear market, and help designers stay ahead of the competition with creative product innovations and marketing strategies.